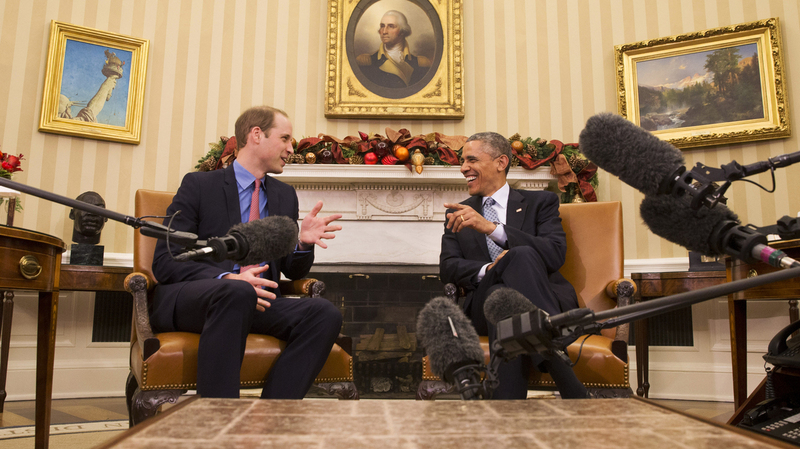 A Fleeting Peek At The Prince And The President : It's All Politics Prince William visited with President Obama in the Oval Office on Monday, where reporters were privy to inaudible small talk. The White House said the president was looking forward to "thanking The Duke of Cambridge for the hospitality shown to him by the Royal Family during the President's recent visits to the United Kingdom." The visit of Britain's Prince William to Washington, D.C. has been greeted with the excitement reserved for celebrities in a town starved of real famous people (I mean, spotting Sen. Chuck Schumer at a restaurant can lead to breathless "spotted" tweeting). Folks are disappointed that his wife, Kate, the Duchess of Cambridge, didn't make the trip down from New York City with him. But, this is D.C., and we'll take what we can get on an otherwise slow news morning. So, the media gathered a little early in the White House briefing room to get into position for a brief "pool spray" before Prince William's Oval Office meeting with President Obama. 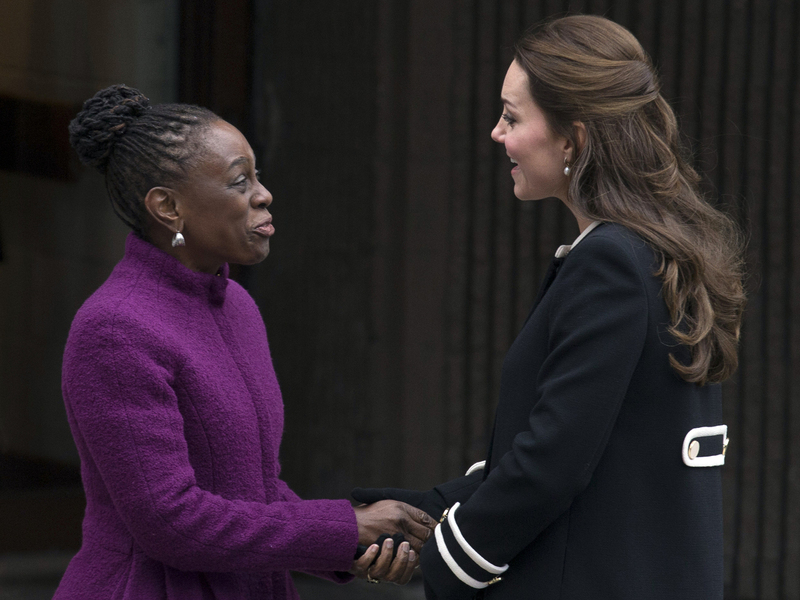 Meanwhile, Kate, Duchess of Cambridge, met with New York City first lady Chirlane McCray at the Northside Center for Child Development in New York. Reporters were ushered into the Oval Office, where the prince and the president sat in the traditional chairs used for such dignitary meeting. And literally 20 seconds later, the White House press wranglers started saying "thank you pool." That's the cue to leave. After just 20 seconds! Often in cases like this leaders will say at least a little something like "I'm so glad to welcome ... " or something. But this time, there were no remarks. The president and prince made small talk that was largely inaudible to reporters. A White House advisory setting up the meeting said, "The President looks forward to thanking The Duke of Cambridge for the hospitality shown to him by the Royal Family during the President's recent visits to the United Kingdom. This visit underscores the special relationship between the United States and the United Kingdom." Undeterred, reporters started shouting questions, as reporters often do during pool sprays. But Obama and Prince William didn't take the bait. "Thank you very much," Obama said. In response to an inaudible question, presumably about Prince William's United for Wildlife organization and efforts against the illegal wildlife trade, Obama said "very important work." As members of the media were slowly eased out of the room, the president added "good to see you, though." Finally, in response to a question from radio pooler Bob Costantini of Westwood One News about his throat, Obama said, "I'm fine. I was completely fine." Obama received a CT scan over the weekend to check out a persistent sore throat. The physician to the president said in a statement Saturday that Obama was suffering from "soft tissue inflammation related to acid reflux."